Learn an Evaluation Model and Family Intervention with "FAMILY NURSING GAME"
School of Nursing Santa Maria,Travessa Antero Quental, Porto,Portugal. Family has varied its structure throughout time and should be integrated as a focus of nursing care. The aim of this study is to assess the impact of a game in teaching families nursing practices. It is a quasiexperimental study with a time setting, integrating nurses in different contexts within the hospital, which it was possible to collect information before and after the intervention. The intervention was the "Family Nursing Game"®, it is a board game. To assess the impact of the training strategy, information was analyzed and documented by nurses before and after the intervention, based on the evaluation and intervention model of Calgary. The results show an increased focus on the family in the various fields of the evaluation and intervention model of Calgary, mainly due to intervention in the affective domain. We can conclude that the game is a useful. Hospital nursing service, Nurse, Family nursing, Continuing education, Educational technology. The transition between health-disease presents itself as a moment of crisis for the family and so family should have a significant role in hospital context, particularly in adults, the elderly, children and pregnant women. Applying the general systems theory we quickly realize that a change in the health condition of one element affects the entire family unit . The results of studies indicate that although nurses have a concept of the importance of families in care, this is not visible in the interventions they develop [2,3]. This problem assumes some complexity when regarding the training of health professionals, focused primarily on the practice of individual nursing care. On the other hand, many nurses do not hold training on family, including assessment and intervention strategies in the family, believing that the family study is part of common sense . 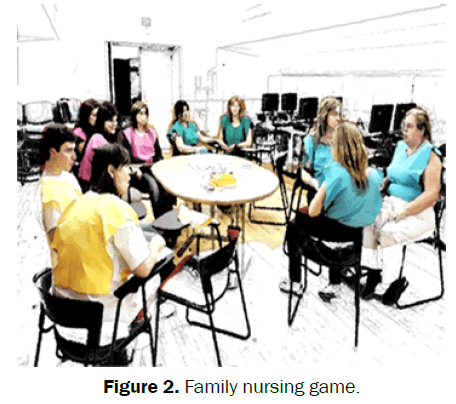 Aware that, as referred by Wright and Leahey, all nurses should be instructed in a way that involves families in health care in all areas of nursing practice, the authors propose the use of this path, a game within an educational program, entitled "Family nursing Game". This game will allow an in-depth look at the family as Focus of Nursing Care Hospital amid spreading the implementation of the Calgary Model of Assessment and Intervention in Family . Why a game? This choice is based on the positive impact of educational strategies at this level, as we see in the game a tool for teaching/learning about family nursing: We’ve questioned: "Will learning from the “Family Nursing Game” Contributes to the changing practices in Family care?" What changes took place in the information documented by nurses on family after the game application? What were the changes produced in the evaluation and family intervention? In order to change the family nursing care practices in a hospital [3,5]. Despite developments, the nursing care is still directed to the individual without considering their family background,grounded in a biomedical model [1,6]. From carried out studies, when analyzing the attitudes of nurses towards the family in the hospital context, what is displayed are mostly supportive attitudes, as a resource to nursing care [6,7]. Studies on the attitudes of nurses via households show the dichotomy between their speeches, which emphasize the importance of family-centered care, and practices, which remains focused on individuals [2,7,8]. The interventions in families are even more deficient in hospitals, particularly in the critical care units [1,7]. The family should not only be seen as a feature of the context of care, but a care target, it must have a significant role in hospital. The intervention in the family is a world view that involves a change of linear thinking to a systemic thinking . Supported in this systemic perspective and with a strong conceptual basis, demonstrating practical ideas to evaluate and intervene in the family in the hospital context, it is proposed using the evaluation model and Calgary intervention. The Wright and Leahey nurses developed an evaluation model and other intervention in so-called family of Calgary Model of Family Evaluation (FHH) and Model Calgary Family Intervention (MCIF) (1984, 1994, 2000, 2002, 2009), recognized by the International Council of Nurses as one of the reference models . The Calgary Family Assessment Model (FHH) is a multi-dimensional structure composed of three main categories: structural, developmental, functional. Each category contains several subcategories, forming a branched diagram. It is important that each nurse decides which are the most relevant subcategories and appropriate for exploration and evaluation within every family and every moment in time . The Calgary Model of Family Intervention (MCIF) is associated with the Calgary Model of Family Evaluation being an organizing framework for conceptualizing the intersection between a particular domain of family functioning and specific proposal by the nurse intervention, these interventions seek to promote improvements or sustain family functioning in three distinct cognitive, affective and behavioral domains . Wright and Leahey in developed work permit to offer nurses a solid theoretical foundation for the intervention and evaluation within the family, providing clear models, guidance skills to develop during the interviews, describing concrete examples and highlighting the impact of interventions within the family. They are based on some theoretical foundations and world views, including postmodernism, the biology of cognition and general systems theory; cyber security; communication theory and theory of change. The CFAM (Calgary Model Assessment Family) and CFIM (Calgary Model of Family Intervention) can be used in any context of the practice of care, including the hospital [1,10,11]. Today’s graduates are consumers with a high level of demand; their expectations on learning are high, becoming even a challenge for the most talented and experienced trainers . In today's world, to create an effective learning environment is not an easy task, assuming a higher complexity on health professionals . According to Herrman, we can more often recall learning experiences that we consider most effective and retain the information transmitted to us in a unique, innovative and fun way . The use of a playful approach provides the criteria for effective learning, in the sense that draws attention to a particular subject, the meaning can be discussed among all participants and knowledge is generated from the play, and it can be transported to another field of reality . There have been frequent studies that demonstrate the use of games in nursing education, useful for promoting active learning [14-18].In this study we resorted to a board game. The board games or cards tend to be more appropriate for knowledge and skills development in the cognitive domain. It should be noted that at this level the board game developed by Cesario, whose purpose was to motivate students to learn about nursing models. Other board games were held in nursing education and education for health [19-21]. 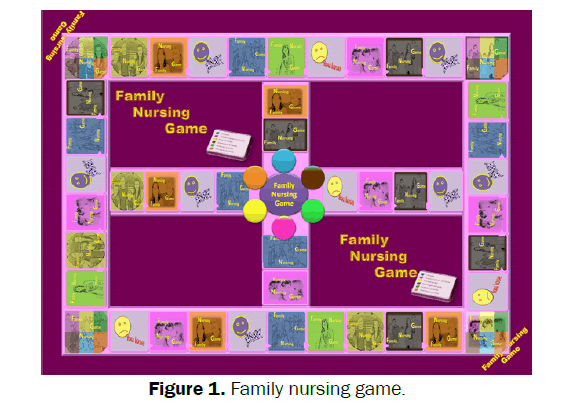 The Family Nursing Game it is a board game in which progress is determined by the capacity of answering questions about Family Nursing content (Figure 1). Figure 1: Family nursing game. The game cards are organized into six themes. They can play up to 30 players spread across six teams with specific colors vests: Orange, yellow, green, blue, pink and brown (Figure 2). Figure 2: Family nursing game. Each team receives a card with a picture of a family type, which then they must acquire the corresponding parts to complete it. The winners are the first team to get the six pieces of the assigned puzzle. In order to assess the impact of the game in nursing application regarding the family approach in a hospital, a quasiexperimental study was made. The quasi-experimental studies are close to experimental studies, but distinguished by the fact that they do not comply with all the conditions or selection of participants and variable control. They are used in natural situations where it is very difficult to meet the requirements of real experimentation. According Polit, Beck & Hungler, This is a quasiexperimental study of the "time series delineation" type, a control group was used. In the design before and after, a group of subjects was rated before and after the intervention in order to observe the changes taking place  (Figure 3). Figure 3: Family nursing game. This research was carried out in a hospital, with a capacity of 140 beds in a population of two hundred nurses from different areas of practice, medicine, surgery, obstetrics, gynecology, pediatrics, neonatology, orthopedics, emergency, operating room, surgical ward clinic and external consultation. As inclusion criteria all nurses who agreed to join the study were included, and of whom it was possible to collect data before and after the intervention. Through a convenience sampling were included in this study 160 nurses representing 73.7% of the total population. All nurses were divided into several groups and randomly integrating nurses from different contexts, to play the "Family Nursing Game". In order to assess the impact of the training approach to family in hospital context an analysis of records conducted by nurses was held. That is to say, a prior analysis of the records was held records performed over a month, and after the intervention. The study site allowed to conduct this research through SAPE® (Computerized Support System Nursing Practice) making use of a sorted language with the terms of the ICNP® (International Classification for Nursing Practice) (2002) . The documented information done by nurse highlights the care of the person and family. The analysis of the nursing process was carried out based on the Calgary Assessment Model and Family intervention, so in the following paragraphs we present the data according to this model, over the two periods (before and after the game). For this route an authorization of the institution's board of directors was obtained, as well as the ethics committee, safeguarding the confidentiality of all information relating to users and participants of the study. The data was grouped and analysed using SPSS version . The 160 nurses who participated in the study are mainly females (86.9%). Regarding the distribution of the age a younger age dominated (being the minimum age of 23 years); the average age is 38.6 years, very close to the median which is 38 years. The distribution of professional experience time has the minimum value 1 year and the maximum time found 37, the average is 16.2 years. When nurses were asked about what types of training they held on family nursing, it was noted that 59.4% of participants reported not having any training. With regards to the processes found, the comparison between the descriptive measures of two stages allows the conclusion there are no significant differences between the two samples of users (Table 1). In the first phase were consulted 536 inpatient cases and in the second phase 567. Table 1: Characterization of respondents processes. Table 2 shows data for the assessment of families, based on the Calgary model of family assessment, which is a multidimensional structure with three main categories: Structural, Functional and Development. Each of these categories contains several subcategories . Table 2: Family evaluation according to Calgary model before and after the game. For analysis of the information on documented data on family assessment, we use all the documentary process in particular, initial assessment and the general notes. Table 2 shows the frequency of items identified and associated with each of the categories and subcategories of Calgary Assessment Model, the total proceedings consulted before and after the intervention. From the analysis of Table 2, it shows an increase of registration rate in some categories that were already present before the formation and the appearance of some subcategories that there was no record in the first phase. As part of the internal structural* review, we highlight the family composition (39.2%), where items are documented as: "lives with his father and stepmother'; 'Teen lives with his mother and four sisters'; the Order of birth, described only in the context of paediatrics (13.9%), "is the only child ',’is the first-born of three brothers'; and subsystems (11.3%). In assessing the external structural** family, larger systems stand out (18.9%) and the extended Family (9.3%). "The larger systems refer to institutions and persons with whom the family has a significant contact . "At this level items such as "formal caregiver 'and' Host Family 'are' documented. In assessing the structural context family***, although no significant records of frequency were displayed. We highlight the environmental issue (1.4%), where some records of the residential building are identified. These factors are particularly relevant for older adults, in particular as referring to the identification of architectural barriers . In evaluating the development of the family****, stages stand out, which records aspects such as "family with teenagers', "family with the birth of children", "Family at the end of life". In the Apart from stages and traced tasks, implicit in the life cycle of family, it is appropriate to evaluate the affective links between its members . Some data has been identified at this level, with regard to strong bonds or negative (2.8%). In evaluating the functional family instrumental***** activities of daily life, they increased after the game, with a 10.2% registration rate. These data are most often documented in the context of self-care, to assess their knowledge about the provider. For example: "The husband already took care of the household, do not need teaching." Finally in assessing the significant functional family ****** before training these roles stands out (4.5%). "This category refers to the established patterns of behaviour of family members" . In this context we highlight aspects such as tension, performance and power to the caregiver role. After the game, there are the subcategories nonverbal communication (13.6%), and verbal communication (7.8%), almost non-existent before the training. In non-verbal communication besides the body posture, touch, gestures, facial movements, are also included proximity and the distance between family members . Some records such as: "The father was not present in the delivery room," or "the child went by the shift change without parent’s visit." are identified. With regard to interventions with families, we used the Calgary model of family intervention (CFIM) to promote, improve family functioning in three domains: cognitive, affective and behavioral. It should be noted that the CFIM is not a list of nursing interventions; it provides a means to conceptualize an adjustment between the domains of family functioning and the interventions proposed by the nurse . The data for the documented interventions by nurses include only interventions aimed at families, as in the evaluation, we use all the documentary process, particularly the care planning, discharge/ transfer and general notes. In the examined cases, interventions found with reference to other family members, not the individual, were grouped in three areas suggested by the authors. As can be seen in Table 3, before the application of intervention is the cognitive and behavioral level arising largely interventions. In particular interventions in the cognitive domain, such as the 'Teaching the caregiver on' or 'Teaching parents about' or behavioral domain examples such as' Train parents on 'or' Train the provider on. Table 3: Family intervention before and after the game. After the game the attendance records in these areas increased, but in the affective domain that becomes more evident change. In this latter area, are found records relating to the promotion and stimulation of family involvement, as well as the encouragement of expressive communication of emotions. "The validation of intense affection can alleviate feelings of isolation and loneliness and help family members to make the connection between the disease of one of them and the emotional response of all . "These paragraphs allow highlight briefly the main results obtained before and after application of the game. The information documented by nurses is particularly important, allowing the communication of essential facts, reflecting planned care, performances and results obtained sequence continues over time. It is very important for the nurse to plan a workable and efficient system to integrate record and document a large amount of complex data in the interviews and intervention with family . On the course of this path an analysis of the information was documented by nurses through SAPE®, to support nursing practice system. Having as theoretical references the Calgary Assessment Model and family intervention we proceeded to the interpretation of the changing practices of care to the family documented by nurses. To compare the number of positive responses between the two periods (before and after), we have resorted to the test of equal proportions and positive responses (with statistical chi-square distribution of 1 degree of freedom, starting from the normal approximation). Thus, the null hypothesis being tested is that the proportions of affirmative answers are the same in both times and the alternative hypothesis is that the proportion after the game is higher. The test results are shown in the following table and show that, for all items included in the table, the decision is to reject the null hypothesis (p-value less than 5%), which means that the percentage of positive responses is greater after the game and, consequently, the training was effective. The results of the application tests show that the dimensions listed in Table 4, the recording frequency is higher at and therefore the game was effective. Table 4: Family assessment-comparison of the two moments. The items that were omitted from the table do not show significant results. In the items of Gender and Sexual Orientation family assessment - internal structural, the number of responses is null in both, so it is not possible to make any test, concluding that there was no change after training. The same conclusion applies to Family Evaluation of items - structural context and circular communication items, influence and power, Beliefs and alliances and unions Family Rating - expressive functional, where the number of answers is null or almost null both times. In items 'Limits', 'Links' and 'Tasks' all the answers before the training are "absent", there are some positive responses after training, so we see that the percentage of positive responses is higher after training and therefore the game at this level was also effective. After the nurse had done the family assessment summary, which shall summarize the theory and practice, she/he should identify the strengths and family problems, developing an intervention plan . In this sense the CFIM guides decisions to the most appropriate intervention proposal, determined by the family and the nurse, in view of the prevailing realm of family functioning which we aim to make the adjustment/change . To compare the records of the family intervention between the two periods (before and after training), we resort to the same of those previously conducted. Table 5 shows the comparison of the results of test of equal proportions, it is concluded that the percentage of positive responses is greater, and after that, consequently, the game was effective. Table 5: Family intervention-comparison between the two moments. In the case of behavioral domain, such as the p-value, it is only slightly greater than 5% and 10% already significant, for example, it can be concluded that the game was effective at this level. Summarizing, it can be concluded that the training was effective in all areas of intervention in the family. Numerous advantages are described with application of games: reduces stress and anxiety in learning; encourages the involvement of trainees [24,25]; reduces the monotony; promotes teamwork and collaboration [24,26]; It creates an environment conducive to learning ; promotes motivation on the subject, gives pleasure; Allows fun and excitement in learning and develops critical thinking [24-27]. Why not use a game? Why can't learning be fun? How often have you heard this?" . Nurses need to integrate the family as focus of their care, to understand the systemic impact of the transition processes experienced health-disease in the hospital context. From the participants who joined the study we highlight that 59.4% said they did not have training at this level. About the game the usage, the appreciation of tradition, culture, and the very resistance to change can be barriers to incorporation of these strategies. We stress that it is important to incorporate active methodologies in the training of nurses, including games. 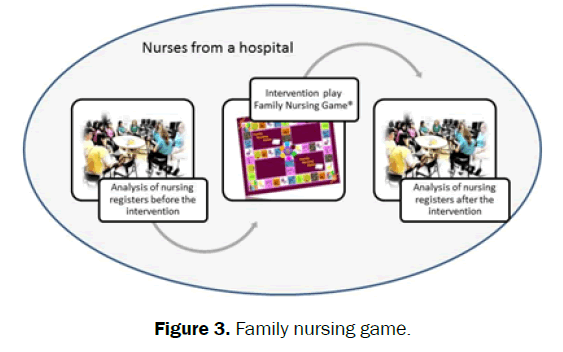 On the impact of "Family Nursing Game", we can conclude that there have been changes in the focus of care, whether in the evaluation and family intervention. Based on the categories and subcategories, of the evaluation model and intervention Calgary, significant increase in the frequency of records, highlighting the interventions in the affective domain. We can conclude that the game had an impact on information documented by nurses, but stressing up the need for systematization and incorporation of these records in the computer system. As we refer the authors Wright and Leahey on the use of assessment and family intervention Calgary model, this can be adapted to all philosophy institutions or hospitals and nursing practice styles, including computerized . Finally we would like to challenge the trainers to integrate games in the most various themes. Wright l, Leahey M.Enfermeiras e famílias: um guiaparaavaliação e intervençãonafamilia. São Paulo (SP):Roca. El-Masri MM, Fox-Wasylyshyn SM. Nurses' roles with families: perceptions of ICU nurses. Intensive Crit Care Nurs2 2009;23:43-0. Duhamel F.Implementing family nursing: how do we translate knowledge into clinical practice? Part II: The evolution of 20 years of teaching, research, and practice to a Center of Excellence in Family Nursing. J FamNurs. 2010;16:8-25. Kaakinen, Birenbaum.Desenvolvimento da família e apreciação de enfermagem da família. In Stanhope, & Lancaster, Public Health Nursing. 2011;Loures: Lusociência. Santos.Abordagemsistémica do cuidado à família: impacto no desempenhoprofissional do enfermeiro. Dissertation for the degree of doctor, Universidade de Lisboa, 2012. Oliveira Pda C, Fernandes HI, et al. Attitudes of nurses towards families: validation of the scale Families' Importance in Nursing Care--Nurses Attitudes. Rev Esc Enferm USP. 2011;45:1331-37. Benzein E,Johansson P, et al. Nurses' attitudes about the importance of families in nursing care: a survey of Swedish nurses. J Fam Nurs2 2008;14:162-80. Fisher, Lindhorst, et al.Nursing Staff attitudes and behaviors regarding family presence in the hospital setting. JAN: original research. 2008;615-23. Figueiredo. Enfermagem de Família: Um contexto do Cuidar. Dissertation for the degree of doctor,ICBAS,Porto, 2009. Legrow K, RossenBE. Development of professional practice based on a family systems nursing framework: nurses' and families' experiences. J FamNurs. 2005;11:38-58. Lee AC, Leung SS, et al. The application of family-nursing assessment skills: from classroom to hospital ward among final-year nursing undergraduates in Hong Kong.Nurse Educ Today. 2012;32:78-4. Herrman J. Creative Teaching Strategies for the Nurse Educator. Philadelphia: F.A. Davis 2008. Bradshaw. Effective learning: what teachers need to Know. In M. Bradshow, & Lowenstein,Innovative Teaching Strategies in Nursing and Related Health Professions.(pp. 3-21). Boston: Jones and Bartlett Publishers, 2011. Coscrato, Pina, et al.Use of recreational activities in health education: Integrative review of literature. ActaPaulista de Enfermagem. 2010;257-3. Baid H, Lambert N.Enjoyable learning: the role of humour, games, and fun activities in nursing and midwifery education. Nurse Educ Today. 2010;30:548-2. Figueiredo, Tonini, et al.Enfermagem e o jogodramático: Reflexões de enfermeirossobre o cuidado de enfermagematravés da imagem. Journal of Nursing Referência. 201;65-2. Boctor L.Active-learning strategies: the use of a game to reinforce learning in nursing education. A case study. Nurse EducPract. 2013;13:96-0. Bowers. Making a game of urgent care: simulation for nursing students: Sue Bowers has devised a board game to help staff develop decision-making and problem-solving skills, and to encourage critical thinking and teamwork. Emergency Nurse.2011;26-9. Leite, Gonçalves, et al.Jogo educativonaorientaçãogrupal de puérperasemalojamentoconjunto: umaestratégia de educaçãopara a saúde. Texto&Contexto. 1998;59-72. Fonseca LM, Scochi CG, et al.Health education for puerperal women in neonatal rooming-in:knowledge acquisition with an educational game. Rev Lat Am Enfermagem.2002;10:166-1. Polit, Beck, et al.Fundamentosde pesquisaemenfermagem. Porto alegre: Art med 2004. ICN (2002).ClassificaçãoInternacionalpara a prática de enfermagem- versão Beta 2.Lisbon: Institute of Computer and Financial Management of Health and Portuguese Nurses Association. Henderson. Games: Making Learning Fun. In Oermann, & Heinrich, Annual review of nursing education, New York. 2005;165-83. Deyoung. (2009). Teaching Strategies for nurse Educators. New Jersey: Prearsonpretince hall. Royse MA, Newton SE. How gaming is used as an innovative strategy for nursing education. NursEducPerspect. 2007;28:263-7.